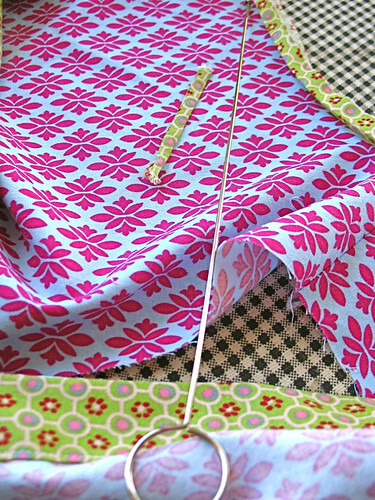 Time for Weekend Sewing (during the week!) and friendship - Stop staring and start sewing! Well I finally had a chance to dig into Heather Ross's new book (and play with Jennifer Paganelli's new fabric!). 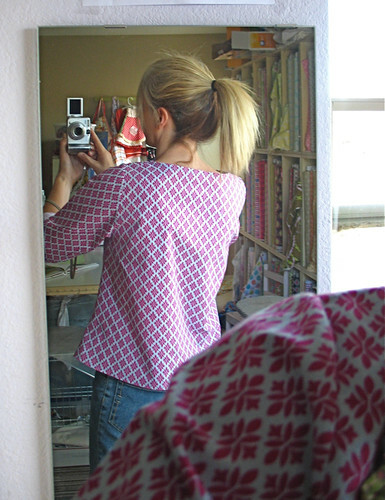 I made the Summer Blouse and it was pretty simple and straight forward. One of the things I really like about it is it's so basic that it leaves plenty of room for improvising and tweaking. The patterns are all in there but must be traced and I discovered I'm completely out of pattern paper. After some semi-panicked scrambling I dug some blue tissue paper out of my closet and it worked out just fine. 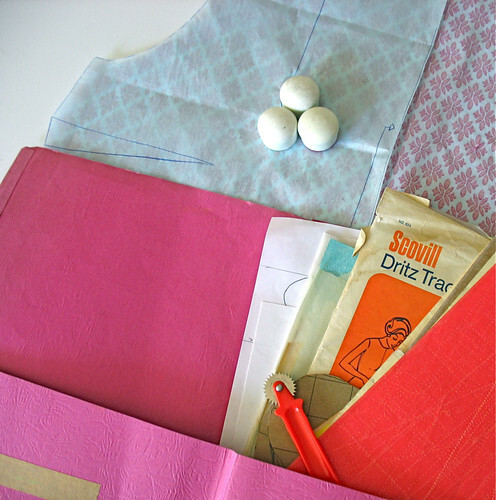 I have an old folder with all of my Dritz tracing paper in it and I recently figured out that it's smart to leave the tracing wheel in the folder pocket (because for some reason kids think they're cool so they disappear). It always thrills me to find something in the place it's supposed to be! 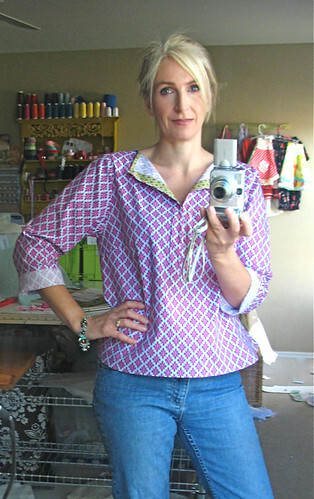 The blouse has a little button loop so I used my loop turner and it worked out nicely (after a couple of tries). But it's a good tool to have if you're making really tiny tubes like spaghetti straps. That green accent fabric is from one of Tracy Porter's lines at Jo-Ann's and I wish she would get herself hooked up with another fabric manufacturer and start producing lots of fabric because she's one of my all time favorite designers. So here is how it turned out. It's not my usual style so it's taking some getting used to. I shortened the sleeves because they looked pretty long in the book. I'm really happy the the neckline folded out because otherwise it was touching my neck and I really hate having clothing touch my neck (Joey hates the fact that I use the word "hate" but I mean it!). It's kind of wide at the bottom for my so I'll take it in next time and I think the style is better suited for a linen or something less stiff (she addresses this in the book so I knew what I was in for). The length is fine but I might add a little to it next time. It's a very comfortable blouse! Here's the back. I really like Ashley's version of the blouse here (especially the neckline) and I'll try some of her ideas next (great blog too!). So I will definitely use this pattern again and I'm sure I'll be thrilled beyond measure with the next one! I took my new blouse out for some fun when I joined Bari J. and her girls for lunch last week. Bari was in town visiting her parents and I'm so glad we were able to get together and chat for awhile! 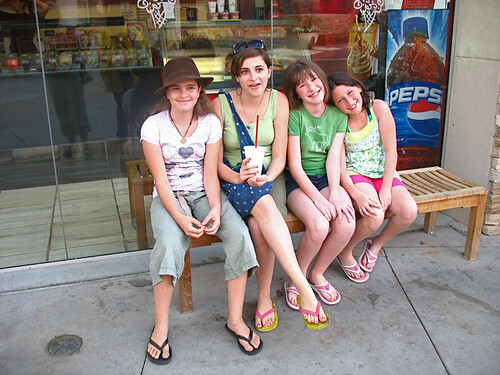 I brought 2 of my girls and after they all warmed up to each other there was a lot of giggling going on. Bari has a lot of great things on the horizon (her fabric, Full Bloom, is coming out in 4 weeks!). She's got such a natural gift for design I loved hearing about her "fabric journey". And I found out we'll be staying at the same hotel in Pittsburgh! It will be like Fabric Camp for Mommies!! Here we are at Coldstone Creamery. We were good though. Bari had yogurt and I had an iced latte. Here are our girls together. Bari's girls struck a perfectly cute pose so naturally. I told my girls we needed to go home and work on that together. Girls are so much fun! I know a lot of people bought the Edith Twirl Skirt pattern last month for Easter (thank you!). If you have made one and haven't added it to the flickr group, please share a picture with us (I'm dying to see what everyone did)! I'm having a sale on Pop Garden, Good Folks and Robots until next week. I haven't sent out a newsletter yet (these dumb allergies are really slowing me down, argh) so you get first grab! Oh and I'm totally re-stocking Darla and Flower Power (it should all be here by Friday). Have a great week (in spite of tomorrow being tax day, ack)! !